Jesus Christ is often portrayed in paintings while speaking or acting, occasionally also while praying, for example, in the garden of Gethsemane. It is not often the case that he is depicted in a state of profound contemplative thought. We do see depictions, however, of his quiet countenance that invite the viewer to contemplation. First of all I think about icons here, where a quiet Christ looks at us and invites us to pray and meditate. Portrayals of the shroud of Veronica have had a similar function in the Western church. In later years Rembrandt painted impressive ‘portraits’ of Christ that invite loving contemplation. The ‘visages du Christ’ by the French artist Georges Rouault (1871-1958) also have a strong sacred radiance on account of their frontality. A few of these ‘visages’ show Christ with downcast eyes and could be called ‘a contemplative Christ.’ But there is no artist who has made such a profound and extensive attempt to reproduce the contemplative countenance of Christ than the German-Russian painter Alexej von Jawlensky. Some of the faces are luminous and cheerful, others are dark and sad or gloomy and mysterious. There are faces of Christ where Christ’s eyes are open. The person who is looking at this face sometimes has an immediate encounter with the face of Christ, but at other times Christ’s eyes look at an invisible reality, for example in the painting from 1919 called Letztes Schauen (The Last Look). However, most of them are contemplative. The eyes and mouth are closed, whereby they evoke an atmosphere of inner immersion in an invisible reality. The face of Christ, dating from 1921, here pictured, is called Resting Light and has great serenity. That does not mean that these pensive facial expressions do not bring about an encounter with the viewer. On the contrary, they invite us to share in the contemplative rest. My friends, the apples that I love because of their magnificent red, yellow, lilac and green garb, are for me, against this or that background, no longer apples. Their nuanced shade and brilliant colours, against the background of other more subdued shades, blend into a harmony that is permeated with dissonances. In my eyes they sound like music that reproduces a certain mood of my soul, a certain fleeting touch with the soul of things, with that ‘Something’ that, hidden and not respected by the world, vibrates in every object of the material world, in every impression that comes to us from outside of ourselves. 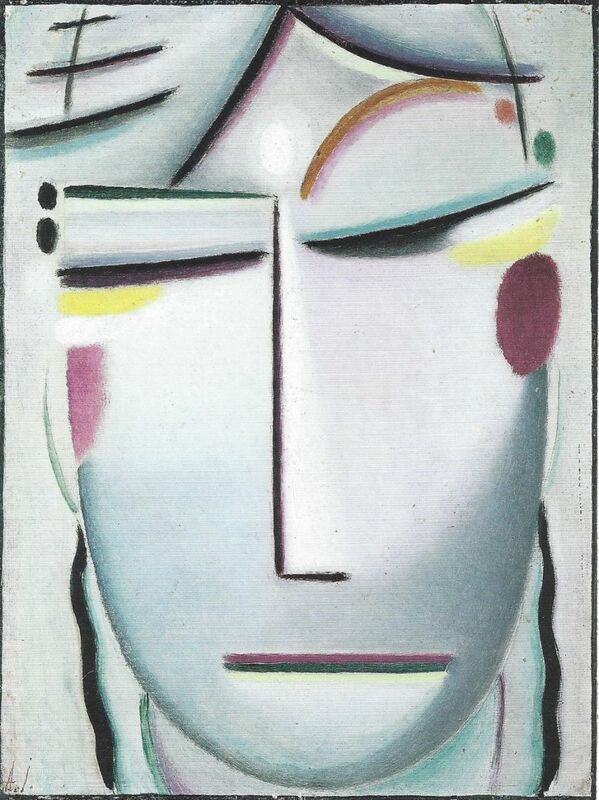 (Alexej von Jawlensky: Köpfe, Gesichte, Meditationen, 121). ... and then it became necessary for me to find a shape for the face, for I understood that great art should only be made with religious feeling. And I could put that feeling only into the human face. I understood that the artist, by means of form and colour, should say what there is of divinity in him. That is why a work of art is a visible God and art is a ‘longing for God.’ I painted faces for many years. I would sit in my studio and paint; I did not need nature to inspire me. It was enough for me to turn inwards, to pray, and to prepare my soul for a religious condition (Alexej von Jawlensky: Köpfe, Gesichte, Meditationen, 125). I am intensely fascinated by pictures of a contemplative Christ. In my room I have an icon of Christ that I painted years ago. When I want to meditate, I kneel down on my meditation stool with my face towards that icon. I don’t always look at it, but sometimes I do. And the eyes of Christ always call me inwards, towards an inner relationship. My prayer and meditation consist for a large part of sitting quietly in front the Face of God. That Face does not really have any form; I cannot imagine what it looks like. I am simply present at a silent Presence. God is an all-encompassing mystery for me, which fills me with a deep love and reverence. Sometimes I need a more ‘human’ nearness. In that case Christ is for me the more human form of God’s nearness. Not that I see or hear anything. The silence continues. And it is good. I sit in silence near my silent, voiceless Lord and Friend. This silent wordless presence is for me the contemplative Christ. And I recognise him in the paintings of von Jawlensky. Alexej von Jawlensky: Face of Saviour: Resting Light, 1921. Alexej von Jawlensky (1864-1941) is a Russian-German expressionistic artist. He was born in Torsjik in Russia. Von Jawlensky served as officer in the army from 1882 to 1896. In addition to this, he took a course of study at the Academy of Arts in St Petersburg from 1889. Together with Marianne von Werefkin he went to Germany in 1896. Around the turn of the century von Jawlensky was already applying his paints in vivid colours, which resulted in a powerful expression. In 1912 he took part in the first exhibition of Der Blaue Reiter (The Blue Rider: an art movement lasting from 1911-1914). After that von Jawlensky concentrated on portraiture. Together with the artists Lyonel Feininger, Wassily Kandisky and Paul Klee he founded Die Blauen Vier (The Blue Four) in 1929. In that year the artist also had to deal with the first symptoms of polio. In the meantime Adolf Hitler had come to power in Germany and introduced the concept of 'degenerate art.' In 1933 the artist already received a prohibition to exhibit and in 1937 more than seventy of his paintings were seized. In 1938 the symptoms of his illness worsened dramatically: Alexej von Jawlensky became completely paralysed. The artist died in Wiesbaden three years later.